For more than 50 years, Health Edco has been committed to providing you with the most innovative, effective health education products to reach your audience. Covering a wide range of essential health topics—from nutrition, diabetes, heart health, pregnancy, tobacco, alcohol, drugs, and many more—our product line is packed with the most colorful, inventive, and engaging health education products available. Health Edco is the go-to resource for schools, hospitals, public health institutions, health organizations, and community-based health programs.To view our Health Edco pdf catalog, click here. Childbirth Graphics’ mission is to help nurture healthy babies and grow healthy families through life-giving education. Covering preconception planning through newborns, breastfeeding, the postpartum period, and early childhood and parenting, our full product line has the essential tools childbirth and breastfeeding educators need for comprehensive instruction. Featuring engaging 3-D displays, essential model sets, reassuring take-home handouts, and more, Childbirth Graphics has been your trusted resource in childbirth education for more than 30 years. To view our Childbirth Graphics pdf catalog, click here. 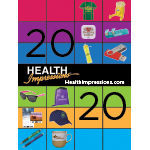 Health Impressions has served the healthcare industry for more than 20 years by providing a wide range of promotional products. These products help build long-lasting, positive name recognition. More than 750,000 imprintable items are available, from economical pencils to premium gifts such as watches and tables cases. To view over 750,000 promotional products, click here.To view our Health Impressions pdf catalog, click here.